CHISINAU, December 25. /TASS/. 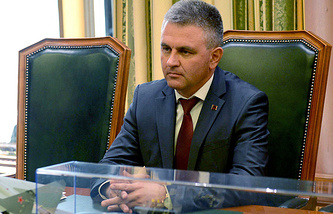 Moldovan President Igor Dodon does not support the government’s calls for the withdrawal of Russian peacekeepers from the unrecognized republic Transnistria, as he himself said at a meeting with Transnistrian leader Vadim Krasnoselsky on Tuesday. "We confirmed the importance of keeping the peacekeeping mission there as a factor of stability in the Security Zone [a demilitarized zone along the Dniester River - TASS]," Dodon wrote on Facebook. "We also pointed out that certain challenges emerged in this regard this year, but we managed to overcome them through joint efforts, avoiding serious complications," he added. Russian peacekeepers were deployed to the conflict zone on July 29, 1992, in compliance with an agreement to peacefully settle the armed conflict in Transnistria that the presidents of Russia and Moldova signed in the presence of the Transnistrian leader on July 21, 1992. At present, Russian peacekeepers maintain peace in the security zone that separates the sides, together with peacekeepers from Moldova and Transnistria and a group of military observers from Ukraine. The Moldovan government, controlled by pro-EU parties, calls for replacing Russian peacekeepers with a group of civilian observers with an international mandate. Transnistria’s authorities strongly oppose the idea as they consider Russian peacekeepers to be the guarantors of peace. In June 2018, the United Nations General Assembly passed a resolution on the withdrawal of the Russian Operational Group, mandated to assist the peacekeeping operation and protect ammunition depots near the community of Kolbasna, which store over 20,000 tonnes of munitions brought there following the Soviet Army’s withdrawal from European countries. Russia pointed out that the initiative, put forward by the Moldovan government, ran counter to efforts to resolve the issue, which are sponsored by the Organization for Security and Cooperation in Europe (OSCE).